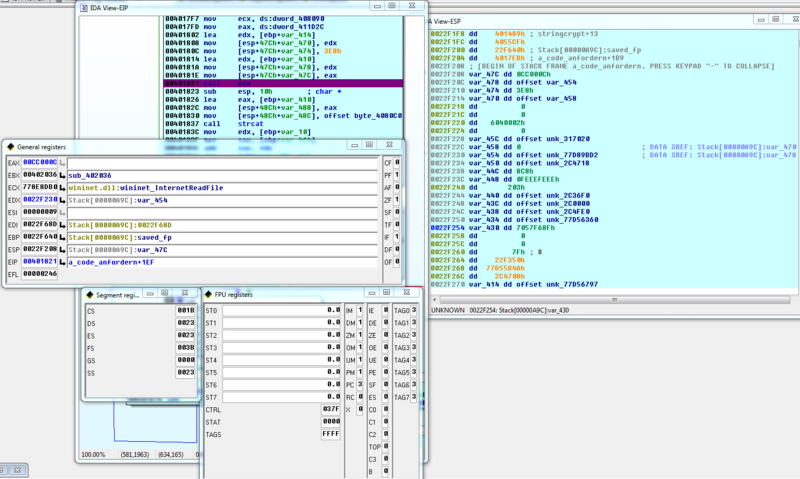 I am a developer but I do not have much experience with IDA/reverse-engineering. Now I have to analyse a compiled program. Currently I try to debug a simple wininet.dll:wininet_InternetReadFile-function and I wonder: where can I see the concrete arguments for this function while debugging? I am pretty sure you can (almost) see the arguments (or at least its address) in this screenshot. But I am a beginner in reverse engineering. I don't get it/don't see it. What is the easiest/best way to get the URL that should be downloaded in this case? Not the answer you're looking for? Browse other questions tagged ida debugging arguments or ask your own question.